Jacob Hanna/Staff Photographer Adam Flint, director of clean energy programs at Binghamton Regional Sustainability Coalition; former South Carolina Congressman Bob Inglis; and Robert Holahan, assistant professor in environmental studies and political science at Binghamton University discuss the impact of climate change and how to combat it. By 2040, the atmospheric temperature will increase by as much as 2.7 degrees Fahrenheit, causing sea levels to rise and intense droughts to become more common, according to a recent report published by the United Nation’s Intergovernmental Panel on Climate Change (IPCC). 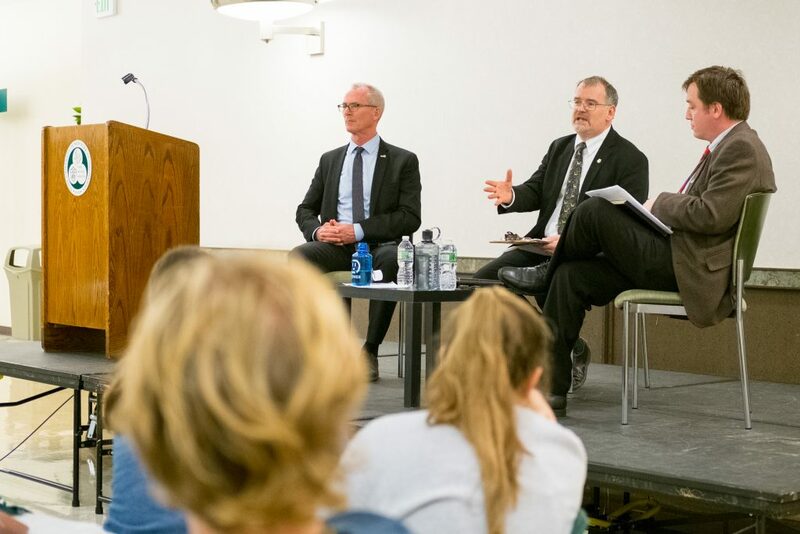 This information was a topic of discussion at “No Sides in Climate,” a panel hosted by the Roosevelt Institute on Monday night in the Old Union Hall. The event aimed to address the dangers of climate change and climate change denial. It featured speakers Adam Flint, the director of clean energy programs at Binghamton Regional Sustainability Coalition, former South Carolina Congressman Bob Inglis and Robert Holahan, assistant professor in environmental studies and political science at Binghamton University. According to Flint, the current climate crisis problem is far worse than the Great Depression or World War II. “It’s an international problem; the threat is very severe, the time is very short and the powers that reign on the other side are very strong,” Flint said. Zachary Frieden, president of the Roosevelt Institute at BU and a senior majoring in political science, said the event was about finding common ground and calling for bipartisan action. “This is what our event is about tonight — breaking down the ideological barriers and working together to devise solutions to one of the most prominent issues facing our generation,” Frieden said. Flint argued the current energy system is largely flawed, noting there is a divide in politics that makes it difficult to implement clean, affordable and safe energy. According to Inglis, conservatives are often difficult to sway to environmental action when using strong liberal language. “If you give them the language of progressivism, they’re going to act negatively, but if you give them the language of conservatism, they’re going to say, ‘This is for me,’” Inglis said. Although Flint and Inglis disagreed on some issues, such as using transition energies like natural gas and carbon taxing, they both said it was up to the younger generations to speak up and address these environmental problems. Flint suggested students get involved with local organizations, educate themselves and others and mobilize the movement. His organization, the Binghamton Regional Sustainability Coalition, advocates for clean energy policies throughout New York state. Inglis said it’s important for young people to speak to parents and grandparents about the issue, even if their political views are different. “Tell them it matters,” Inglis said. Ava Glasser, a senior double-majoring in environmental studies and biology and the president of Intellectual Decisions on Environmental Awareness Solutions (IDEAS) at BU, told students that their actions are powerful, specifically mentioning the importance of the midterm elections on Nov. 6. Although younger generations are expected to bear the brunt of climate change impacts, Holahan said people should not give up hope.